This is my entry for the Sim Oasis Sim House Extreme Makeover Contest, May 2009. I decided to decorate in a French Colonial style, in particular French Colonial as seen in the Caribbean in around the 1600's give or take a hundred years in either direction. There are also a few Indochine and New Orleans influences from that time period as well, but these styles are all closely related and mix nicely. This lot as it is, costs §69,251 and over 300 custom objects/recolors/floors/walls/terrains were used to make this lot. Some of the work (mainly textures) is mine, some of it is other people's (mainly meshes/textures). I've included a list of all the objects I used (see below) and I've included a Creator's List with links to where I got all the custom content. Some of these links are dead because the sites have disappeared over time, but I include them anyway. I also wish to bring attention to my personal file-keeping habits. Every single file I ever download, I edit. I mark where it came from (website name and URL) and the file name in the description (makes it easy for me to find it if I want to recolor it.) Occassionally I change the actual object. I'll make backs invisible on large mirrors, or give it a new texture if I really didn't care for the original one. If you already have any of these objects in your game, unless you want my notes and edits, do not let these files overwrite yours! You'll notice some of the objects have a highlighted check mark next to them ( ) That simply indicates which objects are paysite items. I know my mind on this issue, (I think you've got to have pretty big brass balls to base your work off someone else's, then charge people to use what you've created. Are these paysites paying EA Games royalties for using their legally copyrighted materials? We all know they are not! Let's face it, every single item made for the Sims 2 game is based at some point on EA Games files.) But I leave the decision up to you, if you want to pay for these few objects I've used in creating this house, I've made it very clear where they came from, and you're welcome to go give those creators your money if you desire. To that end, if you believe that paysites are money-grubbing thieves and evil beyond all redemption (I personally wouldn't go that far, though some people do) then I've also included mention of Paysites Must Be Destroyed! and Sims Cave (below). If you don't know what these two sites are, visit them and find out. Bear in mind, this house was created for one purpose - to enter into a contest. It was not created with the express intention of being shared, there was no way I was going to stifle my creativity so that I could avoid using paysite items. I'm sharing this house because people want their own copy of it after seeing it in the contest; but I will not mutilate the work I spent a lot of time creating just to spare someone's irrationally indignant feelings over a couple bucks. And now for the usual Terms and Conditions stuff. Please don't swipe my work and claim it as your own! Do not upload it to paysites or the Exchange (that would be swiping my work!) You may re-use my work (recolors, walls, terrains, floors) and upload it with any lots you care to make and share with others, it must however, remain free of charge. 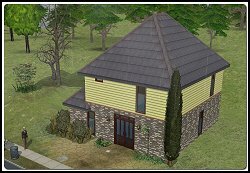 I'd really appreciate it if you did not take this house that I spent a lot of weeks creating, and upload it to another site. I don't mind if you want to share it, just send people back here or to Sim Oasis to get it! There's a damn good reason for this - in case of a problem, I can fix it and re-upload the lot here. I would have no ability to fix any problems should they arise, if this house were hosted somewhere else. Other than that, I cannot force you to comply to my wishes, I'm just asking nicely! SHUT UP ALREADY AND GIMME THE HOUSE! * Note: Only the ''After'' version of this house is available. The ''Before'' version was created only to take pictures, and is long gone! It happens occasionally, you install the house and it doesn't show up when you load the game! If that happens, I found a pretty handy way of fixing the problem. I didn't write this, and the original was in Polish, then badly translated into English. But I did re-write it a bit to cut down on the superfluous ''contects'' (took me a bit to figure out they meant ''contents'' lol) Anyway, credit given where credit is deserved, I found this on Sims2 Design, and it was originally written by Margierytka. If you have problems with installation of any lot (''invisible'' in the game's lot catalog) - here is Margierytka's guide, it really works! After installation of CleanInstaller and Microsoft.NET.Framework (or checking that these programs are installed), go to My Documents\EA Games\The Sims 2\Teleport and delete all files you find there. Install the packaged lot with CleanInstaller, do not delete any of the contents with this program! Install everything. Close CleanInstaller. Go back to My Documents\EA Games\The Sims 2\Teleport and delete all files which are there. You have now deleted the "invisible" lot from lot catalog. Re-open the packaged lot with CleanInstaller and click the house icon "Select lot file only" (top, right side.) Be sure to install ONLY THE LOT. The lot will be in lot catalog, ta-da! Click the name to visit the site, all links open in a new window. If you clink a link and it goes nowhere, then it's a dead link. There are a few sites on this list that no longer exist, but I felt it was right to give them credit for their work, even if they are gone. This list is also, in no particular order. XM Sims 2 Sims Cave Paysites Must Be Destroyed! All text and graphics are protected by copyright law. Other Copyrights & Trademarks are property of their respective owners. Credit for literature and images not created by the owner of this site has been given as known. Copyright © 2009 - 2012 A.E. Wieden. All Rights Reserved.